Following is a response piece to Marc Gunther's recent article, In Defense of the Plastic Bag. Full disclosure: I'm a journalist turned activist who works for a nonprofit called The 5 Gyres Institute founded by Dr. Marcus Eriksen and Anna Cummins to research, educate and act on issues pertaining to plastic and chemical pollution in the marine environment as well as the watersheds that feed them. As 5 Gyres' Policy Director, I have worked tirelessly on chemical, plastic bottle and bag bans across the country. It is my goal to take an objective view of the facts, investigating industry and Gunther's claims in order to ultimately inform the positions of educators, stakeholders and policymakers. Since that voyage, I've sailed across two other oceanic gyres now, the South Atlantic and the South Pacific, witnessing the same pollution in two other oceans. It is exceptionally sad and difficult to explain what plastic pollution in a gyre looks like, but when you see plastic films floating on the surface, two weeks from land under full sail, it starts to give you the cosmic heebie-geebies. It's really that simple. This is why we care. It sure as hell isn't for the paycheck. The garbage patch in the North Pacific isn't the size of Texas, but what Gunther suggests in his piece about the activist role in perpetuating that myth isn't accurate either. Though Angelique White's assessment is right, she's not quoting her own data to debunk the myth she's talking about (let alone the data from the cruise she was on). What's interesting is that environmentalists were blamed for perpetuating the Lonestar State garbage island myth. White issued a press release through Oregon State University meant to debunk the Texas myth. We the environmentalists, applaud this effort. We can't win with money, so we better have bulletproof facts on our side. What I take issue with is Gunther's snarky tone, where he names The Surfrider Foundation and Heal The Bay as environmental groups spreading misinformation. In Gunther's piece, he copies the line from the press release verbatim: "participated in one of the few expeditions solely aimed at understanding the abundance of plastic debris." 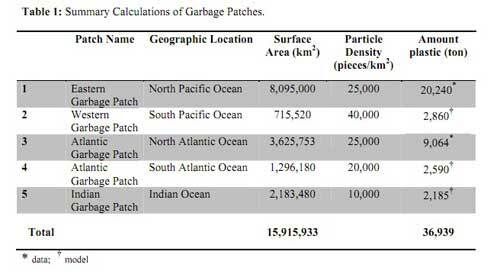 What's interesting is the title of the press release: "Garbage Patch Not Nearly As Big As Media Portrayed." What's ironic is that the press release is unequivocally calling his profession out, not mine. So, in the spirit of Gunther's eye-for-an-eye tactic, is it fair for me to say that the media is responsible for spreading misinformation about the efficacy of plastic bag recycling? I'd say that's accurate. If you're curious about the Texas thing, read SeaPlex's Miriam Goldstein's excellent analysis, here. But let's talk about what we do know, rather than beat up on each other and rely on bad journalism and skewed interpretations of press releases for our facts. After three expeditions in the last year, the 5 Gyres Institute has confirmed its suspicions that plastic pollution exists in all major gyres; we will soon be publishing data on plastic pollution density in the South Atlantic and South Pacific gyre. Now, SEA's data set, like almost all data sets on the subject, account only for the plastic that floats. If you talk to scientists about the issue casually, they tend to believe that the density of plastic in the ocean is much higher than their data suggests and that much more research is needed to accurately portray how much plastic is in the ocean, if that's even possible. What scientists know is that there are 7 billion people on earth addicted to plastic and no matter where they look, even in the most remote of places, they find a plastic stain. When I spoke with Kara Lavender Law from SEA Education this spring about her massive data set, which is the envy of many scientists within this community, she stated plainly that it's still a very small snapshot. But here's another problem. We're only talking about the gyres. There are 315 million square kilometers of ocean surface on planet earth. From firsthand experience on three research expeditions that have sampled inside and outside the elusive borders of the gyres, I can say this, anecdotally: The gyres do concentrate plastic, but plastic is not just within the gyre borders, it's everywhere. Plastic in the ocean varies in density, but not frequency. Ninety-nine out of 100 times you sample, you'll find plastic, even if you're just a few miles out to sea. So what's in the other 300 million square kilometers of ocean that comprises 65% of the earth's surface? Answer: We don't know. Yikes. Here's another problem: Much of the plastic doesn't float. PVC, PET, and PS all sink, and the science community has almost no idea how much plastic is on the ocean floor because sampling sediment in 15,000 feet of water is incredibly expensive, if even possible. What's the most common type of plastic found on the surface? LDPE, HDPE, and PP. Gunther defends the plastic bag in his piece without understanding how plastic bags behave in the environment when exposed to the elements. He states plainly that the garbage patches aren't composed of plastic bags. According to the Ocean Conservancy's annual report, 11% of beach litter is plastic bags, even if you don't see it in the picture he provides. But what happens when a plastic bag enters the ocean? As stated before, plastic doesn't biodegrade in any meaningful timeframe, but it photo-degrades. Thin, flimsy plastic like HDPE with a lot of surface area (like the common bag from grocery stores) photo-degrades faster than thicker plastic. Ultraviolet rays from the sun break the polymer chains of hydrocarbon molecules into smaller pieces and what you end up with is small fragments like the .15g pieces 5 Gyres, Scripps, Algalita and SEA finds in their nets. In short, you might not find a Hilex Poly bag in the "garbage patch" but you surely will find the residue of Hilex Poly's business model there. Doesn't it stand to reason that the biggest culprits of marine plastic pollution are going to come from the most ubiquitously consumed plastic products -- indeed, ones that tend to blow in the wind? In the pantheon of meaningless comparisons, plastic vs. paper has become the main talking point of plastic industry people. First up, why are we comparing a gunshot wound to cancer? Unchecked, they'll both kill you. But here's the real dilemma: Life-cycle analyses of paper vs. plastic are inconclusive and do not take into account the full range of vectors needed to adequately compare the two. Fifty-page reports, like the one Gunther cites in his piece, with a lot of pie charts and graphs, may look convincing, but they still don't pass the sniff test upon closer examination. Reports are based on data sets, and if we don't know, let alone comprehend, how bad the plastic pollution situation is in our world's oceans, how can we factor the impact of plastic bags into a report? We can't. All we know is that we use a whole helluva a lot of them, they fly, and 11% of the trash on the beach worldwide is plastic bags. Depending on which lifecycle analysis one cites, paper often comes out as the larger greenhouse gas emitter -- this is important, as CO2 emissions are making our oceans more acidic and warming the planet. But the study that Gunther cites is from the UK, which means geographically, it can't be applied to a country as large as the USA in terms of attempting to capture emissions from transportation costs or end-of-life emissions and disposal-cost economics. Beyond the report's geographic difference, it doesn't account for the fact that we have the technology to make a 100% recycled content paper bags from 100% recycled paper bags from a renewable resource, trees -- and you don't have to cut down forests to get paper stock! Here's the important distinction about paper and plastic recyclability: According to Mark Daniels of Hilex Poly, only 30% post-consumer HDPE can be used to make a new bag, which means 70% of a "recycled" plastic bag comes from virgin sources (non-renewable natural gas, he says). If we apply the laws of mathematics to our axiom, we get this: For every plastic bag you recycle, you create 3.3 more, as a result. And sometimes, recycled HDPE gets downcycled into other products like decking materials. The problem is that plastic decking materials have a lifespan too, and no strategy for reclaiming them at the end of that lifespan has been introduced. If the goal is to reduce plastic accumulation in the environment and the ocean, is creating more plastic from existing plastic the best idea? The fact that plastics concentrate dangerous chemicals isn't yet figured in. According to a Scripps study, 9% of "garbage patch" fish showed evidence of plastic ingestion -- the fish that serve as food-chain fish for the ones we eat are eating little toxic plastic bombs. Perhaps worried that the reusable bag companies might bite into Hilex's bottom line, Daniels and friends decided to sue California-based reusable bag maker, Chicobag, but later dropped the suit after Chicobag CEO Andy Keller called out the veracity of Hilix's recycling claims. In addition to bullying social entrepreneurs who try to address the problem, Hilex has also tried to scare consumers about the dangers of reusable bags by funding a study (through the American Chemistry Council's Progressive Bag Affiliates, of which Hilex is a member) on bacterial contamination of reusable bags. The study (download -- PDF) found that 12% of their whopping 84-bag sample size found E. coli, and all but one contained bacteria. This finding spawned scary headlines in newspapers like the Washington Post that read Reusable Bags Found To Be Full Of Bacteria. But here's the problem: None of the bacteria, or the strains of E. coli present in reusable bags are harmful to humans. And Hilex knows this, though that didn't prevent the company from spinning the report to the media to create a Texas-sized panic. Thankfully, the study was officially debunked by Consumer Reports. My favorite gem from the article comes from senior staff scientist at Consumer Reports, who said, "A person eating an average bag of salad greens gets more exposure to these bacteria than if they had licked the insides of the dirtiest bag from this study." That should effectively end the debate. Never mind the admission provided by Hilex Poly that demonstrates that they can't make a plastic bag out of a plastic bag. Let's talk about recycling rates and the skewing of the data done to serve Hilex's own interests. First up, HDPE is worthless unless you live next door to Hilex Poly. Gunther says that Hilex pays $300-$400 per ton for mixed films, bags and wraps. What he doesn't mention is that this price is paid for the stuff when it's bailed and delivered. But in most cases, it costs more to deliver the plastic to recycling facilities than the plastic is worth. Ask your grocery store where the plastic bags go that you redeem for recycling. Follow the chain of custody. Nine times out of 10, it's probably a dead-end, destined for a landfill -- or worse, for a slow boat to China, to be burned for fuel. It's not being recycled. Gunther also says that Hilex wishes it could get more plastic. Said Mark Daniels, "It is less expensive for us to collect, purchase, transport and reprocess that materials (sic) to all of our other plants than it is to purchase virgin materials." Perhaps they should fire their CFO and their VP of Operations. The supply side of this business model outweighs the demand side by a massive amount, which means the economic model is bad. If the economics were are so good around the Hilex model, and indeed plastic was as valuable as Daniels states, why is Hilex importing virgin plastic bags from China to sell to their customers, when there are stacks and stacks upon stacks of clean HDPE and LDPE all over the country that he could be buying? I'm also curious about Daniel's apparently jittery board of directors, who may be worried about investing in recycling when they can't even begin to handle the existing plastic in the US. What probably makes their directors jittery is this: Hilex Poly has no idea how many plastic bags they recycle and if they do, they're not telling. They are making claims, however, which are false. In one of Hilex's blog posts they claim that "PE recycling of bags, wraps in films is up to 15%!" Note that they don't say, "HDPE" recycling rates, which are actually, down. Truth is, bags, films, and wraps are not sorted by Hilex or anyone else. My guess, which is good as anyone's, including Hilex's and the EPA's, is that fewer than 1% of plastic bags are recycled. Had Gunther read page 9 of the EPA report (PDF), on which he hinges his entire argument for saving the plastic bag, he'd notice that recycling rates for HDPE aren't going up, they're dropping. In 2010, the recycling rate for HDPE was 4.3%, compared to 6.1% in 2009. Curiously, the 15% total capture rate that Hilex cites isn't even in this report. That plastics bags are 100% recyclable isn't the issue. It's that by a massive percentage they are not recycled. Even when they are, we end up with more plastic in the environment instead of less. And if we believe we're making modest gains in plastic bag recycling each year -- which we're not -- consumption rates far outpace recycling rates. Furthermore, why are we investing in a system that has to fabricate bag recycling rates to trend positively, even though the fabricated trend still amounts for next to nothing? What society accepts a 4.3% efficacy rate in any system without abandoning it and going back to the drawing board? When it comes to plastic bags, there's only one thing to do that's 100% effective: Ban them. This post first appeared on GreenBiz.com.